From talking pigs to steam engines and aardvarks to trucks, children’s books cover a huge range of people, places and things that are rarely part of a child’s day to day life–but what about the microchips that make up the toys and tools they play with every day? For a free and fair technological society to flourish, it is critical that all kids are at least introduced to, even if they do not go on to master, what’s under the hood in their high-tech laptops, tablets and smartphones. Not every child will be the next Gates, Jobs, Allen or Woz. Not every child will mastermind a technological revolution. But there are millions of people involved in STEM/STEAM/STREAM industries who are critical to the development, manufacturing, and distribution of technology who are NOT scientists or engineers. And they all benefit from understanding the basic structure and principles of the machines they are helping deliver to the world. THERE ARE MANY, MANY MORE PEOPLE INVOLVED IN ELECTRONICS THAN JUST ENGINEERS and SCIENTISTS!!! And while not everyone is destined for advanced STEM college degrees, every child should be introduced to the myriad ways to participate in technology. Pragma Design, a tech company in Austin, Texas, is launching Pragma Media to help reach kids – the future engineers and scientists, the future tech workers, and even those who are “just” tech users. 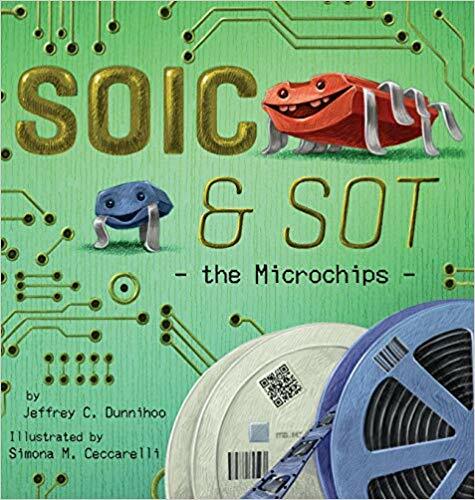 Pragma Media’s first project is a picture book series entitled SOIC and SOT (and Friends), The first book will publish with one book in Fall 2018 and two books in 2019. The books have been created to help provide a first step into the future for children, parents and teachers, and especially those who are not already involved and conversant in technology and microelectronicscareers. Each book will have corresponding online resources for educators and parents, reachable through QR codes throughout the books. About the Author: Jeffrey C. Dunnihoo is an electrical engineer with over 30 years of experience in semiconductor and system development. A young computer nerd in the early days of 8-bit home-brew computers and Fortran mainframes, Jeff has been awarded several patents and co-authored research papers and the “System Level ESD Co-Design” textbook. About the Illustrator: Simona M. Ceccarelli has never donned an ESD suit, but she has worn a labcoat for many years. As a professional artist, she now mixes colors instead of chemicals, but the taste for science and technology often leads her to projects that stride art and science. Simona lives in Switzerland, where she illustrates books and other products for children, raises some of her own and tries to keep the sense of wonder forever alive. About Pragma Design: The word pragma is Greek (πραγμα) for “stuff.” Pragma℠ Engineering Consulting has been helping engineers design better “stuff” since 1997. Whether in Consumer Electronics, Computers, Automotive or Aerospace, Pragma℠ Consulting brings a history of Hardware, Software and Firmware design and development experience to new products, and provides expert analysis of problems which arise at every stage of product from prototype through production and into the field. About Pragma Media: In the course of Pragma Design’s consulting, the increasing amount of multimedia resources required for the communication and distribution of leading edge technological and educational multimedia has necessitated the launch of Pragma Media in 2018. Additionally, Pragma Media focuses on the educational pipeline entry of Pre-K and entry-level teaching materials, curricula and instructional electronic systems worldwide, especially targeted at technologically developing areas.